This is a Christmas gift. 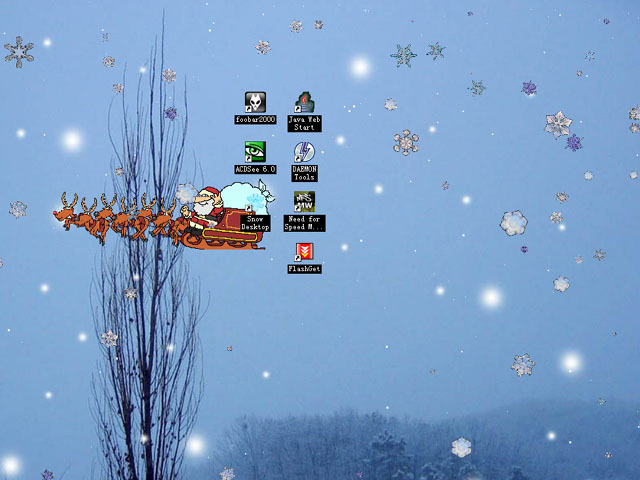 Beatiful snow combination includes Snow Desktop and Snow & Santa Screensaver. Snowflakes are falling from the sky and dancing in the wind. As music is being played, Santa with his sled drawn by reindeer is coming on his way to your home. It's creative and very special program. It's real art. Lovely tree with twinkling lights and falling snow. Cute animated Christmas Screensaver with full-length Christmas medley. Snow falls gently over beautiful Christmas scenes as carols play. A Beautiful Christmas snow screen. A Beautiful Christmas snow scene with a home decorated for Christmas. A Beautiful Christmas snow scene of a freshly cut Christmas tree. Shows a beautiful Christmas scene of children playing in the snow. Qweas is providing links to Christmas Package 2 as a courtesy, and makes no representations regarding Christmas Package or any other applications or any information related thereto. Any questions, complaints or claims regarding this application Christmas Package 2 must be directed to the appropriate software vendor. You may click the publisher link of Christmas Package on the top of this page to get more details about the vendor.